You'll be £50.00 closer to your next £10.00 credit when you purchase French Warships in the Age of Sail 1786 - 1861. What's this? In 1786 the French Navy had just emerged from its most successful war of the eighteenth century, having frequently outfought or outmanoeuvred the Royal Navy in battle, and made a major contribution to American independence. The reputation of its ship design and fighting skills never stood higher, yet within a few years the effects of the French Revolution had devastated its efficiency, leading to defeat after defeat. Fine ships continued to be built, but even under Napoleon's dynamic influence the navy never recovered sufficiently to alter the balance of sea power. It was only after 1815 that the navy revived, espousing technical innovation and invention, to produce some of the most advanced ships of the age. This book is the first comprehensive listing of these ships in English, and follows the pattern set by the companion series on British warships in the age of sail in providing an impressive depth of information. It is organised by Rate, classification and class, with significant technical and building data, followed by a concise summary of the careers of each ship in every class. Thus for the first time it is possible to form a clear picture of the overall development of French warships in the latter half of the sailing era. A comprehensive picture of the overall development of French warships in the latter half of the sailing era, and one that has its special place on my own reference book-shelf. This magnificent new volume by Winfield andRoberts on French warships in the seventeenth and eighteenth century, covering the period almost up to the outbreak of the Revolutionary & Napoleonic Wars provides a prodigious amount of detail on all the ships of that time. Clearly not a book at bedtime this masterly compendium provides a major source of detail on the French navy for the serious naval historian. Beautifully produced with a wealth of black and white images, diagrams and plans most strongly recommended. This book is the latest in a series of excellent naval reference works of the Age of Sail published by Seaforth Publishing. The information on the various ships catalogued is comprehensive, these are invaluable reference works and Seaforth are to be commended in producing these titles. An invaluable resource that complements four previous volumes by Winfield covering the British warship from 1603 to 1863 and also Seaforth's works on Russian and Dutch warships in the age of sail. Together these seven volumes form a definitive survey of a subject of huge value and interest to naval historians as well as general readers. The French navy volume covers the Great War of 1792-1815, the Russian War (1853-1856), the early French steam ships and the first, broadside, ironclads. It should appeal to a wide range of readers. The formula will be familiar. Separate chapters dealing with each type of ship, divided chronologically and each entry accompanied - as far as is possible - with detailed notes on construction and in some cases remarks on a ship's history. Perhaps the most poignant is the entry for Bucentaure. 'Captured at Trafalgar by the British, retaken by her crew next day... but wrecked off the entrance to Cadiz'. Winfield took two volumes to cover the same period of the Royal Navy, so inevitably there is less information. Nevertheless, Winfield and Roberts manage to tell the tale of Bonaparte's navy. It is a monumental work of research, an important addition to scholarship and a new, standard work of reference for which Winfield and Roberts deserve warm congratulations. Author Rif Winfield has a lifetime's expertise of the sailing warship. He is a specialist in British sailing warships and has written a number of highly regarded books on the sailing navy. In this project on the French warships from the period 1786-1861 Winfield found his brother in arms in Stephen Roberts, who is a leading American authority on French warships, and those of the nineteenth century in particular... This book is the first comprehensive listing of these ships in English, and follows the pattern set by the companion series on British warships in the age of sail in providing an impressive depth of information. This is a very useful reference book, providing the other side of the picture to the books on British warships and demonstrating the huge amount of effort that the French put into their fleet and a series of attempts to overcome British naval power. The expanse of new archival research work reflected here involved is staggering, and unimaginable some 50 or 60 years ago. The book eclipses any predecessor volume in some important respect and adds completeness, precision, and illustration that will stand for many long years to come. It reflects the many years the author has spent searching out bits and pieces of data among large central state archives. The stories of many of these ships previously were hopelessly obscure, based on very limited published information, but now become readily available in finely nuanced detail. Rif Winfield is known for his excellent series of books detailing the composition of the Royal Navy's sailing fleet from the smallest craft to the largest line of battle vessel, from the early 1600s to the closure of sail in 1863. Now, with Stephen S. Roberts, they have put together a volume covering the French Navy for the period from the wars of 1986 and the French Revolution, through the Napoleonic period to the cessation of sail and introduction of steam in 1861. A truly stupendous volume full of facts and information on a vessel by vessel basis. The authors have truly excelled themselves and following the layout adopted for the volumes covering the British Navy, have produced what is a complimentary "Bible" of the French Navy during this period. Beautifully produced to a very high quality level, this is an indispensable volume for any researcher, maritime historian, modeller or serious student of the naval ships of the French nation that was, throughout the period covered, continually Britain's arch-rival and major enemy at sea, and also one that was a respected and much-imitated leader in naval architecture and maritime technical advancement. This book is quite a remarkable work of reference, and deserves to be included in the library of everyone interested in this period of maritime naval history. I have a number of books by Rif Winfield and have great respect for his scholarship. This one is co-authored by Dr Stephen S Roberts, a leading American authority on French warships, and those of the nineteenth century in particular. In 1786 the French Navy had just emerged from its most successful war of the eighteenth century, having on many occasions it has to be said outfought or outmanoeuvred the Royal Navy in battle, and made a major contribution to American independence. The reputation of its ship design and fighting skills never stood higher, yet within a few years the effects of the French Revolution had devastated its efficiency. It was only after 1815 that the navy revived, espousing technical innovation and invention, to produce some of the most advanced ships of the age. 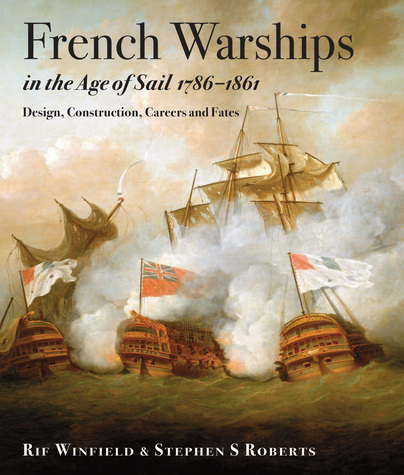 A fascinating account of the design, construction, careers and fates of French warships in the latter half of the sailing era. This comprehensive work is well structured and is an excellent reference work for all those who wish to know more about the French Navy which receives far less attention than it's main rival the Royal Navy. As the cover description says, it is possible to form a clear picture of the overall development of French warships in the latter half of the sailing era and into the age of steam when it started to recover from it's wartime losses and through technical innovation and invention produced some of the most advanced ships of the age. Recommended.